This 'rare' 19th century medical notebook was discovered in boxes at the Hospital of the University of Pennsylvania's neurology department. Plenty has changed in the field of neurology in the past century and a half. That may seem obvious, but after the discovery of a "rare" medical notebook at the Hospital of the University of Pennsylvania, some Penn staff are reminded of just how drastic that change has been. “We didn’t have time to read every page but it’s very interesting to see all sorts of ailments listed, from hysteria, to chronic alcoholism, to spermatophobia [a fear of sperm],” said JJ Ahern, senior archivist at Penn’s Archives Center, said Friday. 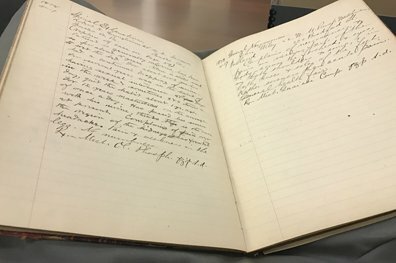 The notebook, dating back to the late 19th century, was recently uncovered by Penn staff rummaging through boxes in the neurology department. It serves as a "window into medical history" and provides "rare insight" into how nervous system disorders were treated at the time, the hospital said. In 1875, the Dispensary for Nervous Diseases was one of the hospital's original seven dispensaries. Located in the basement, it treated patients who were either not sick enough to be admitted into the hospital or wouldn't consent to being admitted. After reviewing the notebook, Dr. Geoffrey Aguirre, associate professor of neurology, noted that while much has changed in the field, much has stayed the same. “There are terms in these notebooks that date back to the earliest days of neurology. We use different medical terms now but these old-fashioned ways of describing particular medical disorders colors the history of the field,” Aguirre said in a press release. The notebook is now listed as an official Penn historical artifact, but it may not be complete. The hospital said the notebook has a numbering system, and gaps in that system suggest some parts of it are missing. In hopes of finding the lost pages, Penn is sending a message to its staff: Keep your eyes peeled.